"Jackals may be superior marksmen and they're very sneaky, but that doesn't make them excellent snipers — they’re a little too bloodthirsty for that." The Kig-Yar (sometimes rendered as "Kig-yar"; Forerunner designation: Perosus latrunculus, Latin for "hateful bandit"; UNSC designation: Covenant secundarium carnivora prœdonis, Latin for "Covenant secondary carnivorous combatant"), are a dinosaur-like saurian species. Following their assimilation in 1342 CE, the Kig-Yar served the Covenant until its dissolution in 2552. Many went on to aid its remnants as mercenaries and privateers, though the majority stayed independent of any such factions. There are several distinct races of Kig-Yar, though humans have commonly identified two groupings (Jackals and Skirmishers) based on encounters in the battlefield. In combat, Kig-Yar typically served the Covenant as snipers and scouts due to their excellent senses of sight, smell, and hearing. The Kig-Yar were one of many species indexed by the Librarian as part of the Conservation Measure and preserved on Installation 00 from the firing of the Halo Array. They were subsequently returned to their homeworld, where they began rebuilding their culture. During their early history, Kig-Yar society was divided into clans that sailed across Eayn's seas as pirates, raiding the encampments and settlements of rival clans. Ancient Kig-Yar once experienced a gladiatorial era, similar to humans. These ancient Kig-Yar would hold inter-clan physical combat competitions in the largest population centers on Eayn's biggest continent. Eventually, the clans united, and the Kig-Yar species worked together in developing space-travel technology. Shortly afterward, they established colonies on many small asteroids and planetoids around Chu'ot. The Kig-Yar on these asteroids were sustained by gray market trade and developed free from the government that dominated Eayn. Some Kig-Yar continued their ancient ways of life and became pirates once more, preying upon merchant starships. The piracy and looting in the system lead to the Kig-Yar government's militia recruiting selectively picked Commandos from sectarian societies from the asteroids that orbit Chu'ot. The Commandos fought off the pirates in an extremely ruthless and precise fashion. When the overwhelming Covenant military juggernaut arrived in the Kig-Yar home system in 1342, the Kig-Yar pirates and militia joined forces in an attempt to fend off the alien intruders. At first, the Covenant arrived in the Kig-Yar home system with small contingent fleets. These fleets were directly attacked by ruthless Kig-Yar pirates and mercenaries, leading to a long naval war in the system. Despite the sheer strength and numbers of the Covenant, the Kig-Yar used the Y'Deio system to their advantage. It was difficult for the larger Covenant ships to maneuver through Y'Deio's abnormally dense asteroid belt compared to the Kig-Yar's smaller vessels, while Kig-Yar forces could use the asteroids for hiding. The war between the Covenant and Kig-Yar forces culminated in sieges of redoubts on the asteroids surrounding their world. Eventually, realizing the unlikelihood of them winning the war and the opportunity to profit from the expansion of trade, they accepted Letters of Marque: commissions from the Ministry of Tranquility to engage in the services of the Covenant, though often this was merely used as an excuse to continue their plundering lifestyle. The Kig-Yar would spend much of their time preying on the ships of the Covenant's enemies, such as humanity. Kig-Yar poisoning the Unggoy infusion supply. Kig-Yar are around the same level as the Unggoy in the Covenant hierarchy, although the Kig-Yar despised the Unggoy and believed themselves to be superior. This reached a boiling point in 2462, when the growing Unggoy population on High Charity put pressure on the Kig-Yar as many of the Kig-Yar were forced to relocate their homes and nests to accommodate the Unggoy. The relocation caused stress for female Kig-Yar that were going through their incubation cycles, and Kig-Yar infant mortality rose on High Charity and the birth rate declined. To exact their revenge, a radical group of Kig-Yar shipmasters poisoned infusions—recreational narcotics the Unggoy enjoyed—on High Charity and on the vessels operated by the Kig-Yar which left many male Unggoy sterile. Although a junior staffer in the Ministry of Concert found evidence of this, the High Council failed to properly investigate the incident, as they were willing to accept several thousand sterile Unggoy rather than risk upsetting the Kig-Yar. As a result, the offending Kig-Yar were not imprisoned and the guilty shipmasters were simply fined for damages. The lack of attention and the case's results eventually culminated to the Unggoy Rebellion. The Unggoy began to attack, not only the Kig-Yar but, all other races in the Covenant. The Sangheili and Kig-Yar faced difficulty quelling the rebellion, which led to an Arbiter partially glassing Balaho to convince the Unggoy to surrender. A Kig-Yar missionary ship, the Minor Transgression, was the first Covenant vessel to make contact with humanity. The ship raided a commercial freighter leaving the planet Harvest, and the events that followed would later lead to full-scale military action on the part of humanity and the Covenant. The Kig-Yar serving with the Ministry of Tranquility would continue to patrol the space around humanity's known territory. The Kig-Yar were responsible for discovering numerous human colonies, such as Madrigal, and would report their findings to the rest of the Covenant fleet. Following the outbreak of the Human-Covenant War, human encounters with Kig-Yar were brief and poorly documented. Rumors and fragmentary evidence pointed to incidents of Jackal piracy against human civilians. In 2535, a group of Kig-Yar under Reth discovered the Rubble, a community of Insurrectionists and human survivors of the glassing of Madrigal, while attempting to mine the asteroids in the 23 Librae system. Peter Bonifacio, a member of the Rubble Security Council, made contact with the Kig-Yar and agreed to trade Covenant weaponry in exchange for human slipspace drives. Although the humans believed the Kig-Yar were rebels defying Covenant authority, they were in fact secretly proceeding with the blessing of the High Prophet of Truth to use the weapons to map UNSC space and learn the location of Earth and other human colonies. Reth had created an Unggoy army on a nearby moon with the intents to attack the Rubble with it and use it for Kig-Yar nesting grounds. However, the plan fell apart due to the High Prophet of Regret sending Sangheili warriors to investigate the weapons, believing the Kig-Yar to be heretics. During the Great Schism, many Kig-Yar sided with the Jiralhanae troops loyal to the Hierarchs against the Sangheili. However, the Minister of Discovery predicted that the Kig-Yar would follow whichever side would lead them to profit. Some Kig-Yar protested against the Jiralhanae and San'Shyuum at the dawn of the Schism. Following the collapse of the Covenant and the end of the Human-Covenant War, the majority of Kig-Yar returned to a lifestyle of piracy and trade. The overall population and social makeup of the Kig-Yar remained stable following the end of the war, with their homeworld and major colonies experiencing manageable growth. Many Kig-Yar had dealings with humans, as well as the former Covenant species, in independent locations such as Venezia; some took advantage of the Covenant's collapse and began to loot valuable materials and technology from former Covenant installations. A small number of Kig-Yar were enlisted as mercenaries by conservative Sangheili states, while many served in the various Covenant remnant groups, including Merg Vol's Covenant and Jul 'Mdama's Covenant. A massive pirate faction had settled on the desolate world of Ven III by 2558. A notable exception to the Kig-Yar's chiefly disparate mentality was Shipmistress Chol Von, who wished to gather a formidable naval force to defend the Kig-Yar home system from outside threats. However, few Kig-Yar shared her ambitions and her efforts ended up bearing little fruit. Ruuhtian physiology and skeletal structure as drawn by Doctor Catherine Halsey in 2536. A diagram of an Ibie'shan's neural network. Kig-Yar share many features with Earth avians as well as reptiles and exhibit several features that are common among species that have evolved in low-gravity environments, such as Lacerta erectus. Their legs are sinewy and muscular, and are reverse-jointed in a similar fashion to those of birds. Though they have been mistaken for carnivores, the Kig-Yar are apparently an omnivorous species. Kig-Yar have sharp beaks are lined with razor-sharp teeth, and their tri-digit hands and feet have sharp talons. Their eyes are protected by a nictitating membrane that sweeps across the eyes horizontally. Starved Kig-Yar have been known to eat the flesh of fallen enemies, as well as that of live prisoners. They are gifted with extraordinarily acute senses of sight, hearing, and smell, making them adept as scouts and snipers in the Covenant military. Kig-Yar are also very agile, and can execute swift jumps and rolls in combat; these abilities are most pronounced in the more muscular T'vaoan subspecies, members of which can leap great distances and cover ground at extremely high speeds. Kig-Yar possess a strong salty, occasionally acrid stench. Young Kig-Yar chicks are covered in a brown fledgling down which gradually molts and gives way to scales and plumage as they age. Male Kig-Yar possess plumes of spiny quills (feathers in the case of Skirmishers) at the back of the head and on the elbows; the color of this plumage indicates the Kig-Yar's mood. Quill color also varies between subspecies; Jackal quills typically have brown, red or light blue coloration, whereas Skirmishers generally have black or reddish feathers. Females lack these quills, instead having calloused plates at the forearms and the rear of the head. This thick skin helps protect the female during courtship: when mating, the male will often bite, chew, and tear at the back of the female's head, neck, and arms. Apart from these differences as well as those in reproductive organs, there is no meaningful physical variance between male and female Kig-Yar. While Kig-Yar are somewhat physically frail, they are capable of moving quickly to evade harm. Their blood is bright purple in color, similar to that of the Sangheili, possibly showing a similar chemical makeup. They lack high amounts of calcium in their skeletons, which makes them a poor source of biomass for the Flood. Thus, Kig-Yar that are infected by the Flood are typically turned directly into carrier forms rather than combat forms. However, they have been utilized as combat forms during at least one engagement, the Battle of the Etran Harborage. A closeup of a Ruuhtian Kig-Yar's face. Notice the razor-sharp teeth and scaly skin. Unique even among the diverse assortment of the other client species of the Covenant, the Kig-Yar species has vast genetic variation within their race. The Kig-Yar species is represented by at least three morphologically distinct subtypes. These include the mainstream "Jackals" of Ruuht, the notably reptilian Jackals of Ibie'sh, and the more physically robust and more avian "Skirmishers" of T'vao. Many xenobiologists believe the morphological variation among the Kig-Yar likely represents diverging evolutionary pressures in response to varied environments and ecosystems on prehistoric Eayn and, subsequently, their various interplanetary colony worlds. However, all of the known variations of the species have the ability to effectively breed with all other subtypes of the Kig-Yar species and exhibit no marked cognitive differences. Kig-Yar hailing from the isolated, volcanic continent of Ibie'sh (Ibie'shans) display the most "primitive" characteristics of all the known Kig-Yar subtypes, being closest to the species' common ancestor. 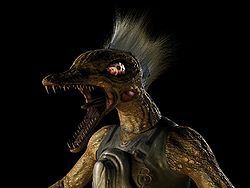 Ibie'shans have the same body structure as most of their kin, but their heads are far more muscular and reptilian in appearance, with shorter snouts and underbites. These Jackals also differ from the more commonly seen variety in having reddish plumes and yellow-tinted eyes. Ibie'shans have served in the Covenant military as early as 2526 and constituted the majority of Kig-Yar in Jul 'Mdama's Covenant. T'vaoans, commonly known as Skirmishers, originated from the Kig-Yar colony asteroid of T'vao. They have darker skin and stockier, squared heads with small yellow eyes. 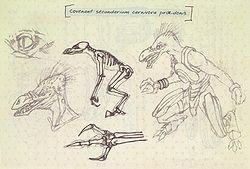 They also have more beak-like mouths and bony facial coverings. T'vaoans have true feathers on their heads and arms, unlike the Jackals' quills. Like Jackals, T'vaoans have sharp talons on their hands and feet. While both subspecies are quite agile, T'vaoans are capable of sprinting at great speeds and leaping long distances. Male Kig-Yar from T'vao had much heavier upper body plumage than other Kig-Yar. Females from T'vao had a ruff of feathers on their heads and necks instead of scales. The higher gravity and more dramatic atmospheric shifts of T'vao led to the development and evolution of these avian features. Kig-Yar are often considered to be driven and motivated solely by personal desires and needs. Ancient Kig-Yar were once divided into clans, scattered across Eayn. The clans would often compete for resources and raid each other's cities or hold inter-clan competitions in major population centers. During the Kig-Yar's service in the Covenant, the clans became slightly obsolete. However, many Kig-Yar still kept their roots to these clans, often living in territory that had been claimed by their clans ages ago. Parts of Myur City, on T'vao, had been once claimed by Chol Von's clan. Kig-Yar clans often work together, unless one clan has grievances with another. Allied clans defend one another, if necessary. The center of a clan is known as the "clan home" and often contains a "clan mother" to cook for the young. Known clans include the Mor clan and the Gei clan. Piracy plays an important role in Kig-Yar society and history. While legitimate organizations, governments, and businesses are found throughout Kig-Yar society, pirates once plagued Eayn's seas. After becoming an interplanetary race, many Kig-Yar returned to piratical ways. Many Kig-Yar chicks desire to be pirates when they grow up. Many Kig-Yar folklore heroes were pirates and represented freedom during the Kig-Yar's service with the Covenant. There were numerous Kig-Yar pirates that operated independently of the Covenant. These pirates would contact and ally themselves with like-minded Kig-Yar that served in the Covenant military. The Covenant-serving Kig-Yar would often contact the pirates when opportunities to steal Covenant supplies and materials arose. Members of other species—including San'Shyuum, Sangheili, and humans—are often distrustful of the Kig-Yar, believing every member of the race to be a pirate. Kig-Yar food aboard a pirate ship. Kig-Yar society is matriarchal, with males described as being “henpecked” by their females and having to toil for a living. Early Kig-Yar society was a form of tyrannical matriarchy. Eayn's government would eventually spread power more widely and equally among the species, though females generally remained at the top. Before the Kig-Yar's indoctrination into the Covenant, female Kig-Yar were in control of breeding rights, territory, familial organization, and had control of major assets. The matriarchal-based society continued after the collapse of the Covenant empire. The expectations of young male chicks are lower than their female counterparts. Kig-Yar females typically hop from mate to mate, however, males generally stay around their mate's nests for as long as they are tolerated. T'vaoans believe themselves to be superior over the rest of the Kig-Yar. Kig-Yar have been known to coexist relatively peacefully with humans, as evidenced by the relationship between the Rubble and Reth's forces on Metisette, the cooperation of Kig-Yar miners on New Llanelli with Office of Naval Intelligence operatives, and their relationship with Insurrectionists on Venezia. When the Kig-Yar were finally ordered by the San'Shyuum to attack and destroy the humans of the Rubble, many of them even regretted the order. This is likely due to the pragmatic, mercantile culture of their race: As long as it benefits them economically, Kig-Yar will co-operate with nearly any group, even declared enemies of the Covenant. Within Covenant society, Kig-Yar have little status and are subservient to all but the Unggoy. Because of this, Kig-Yar frequently harass Unggoy to assert what little authority they have. Despite being rather lowly-ranked in the Covenant, Kig-Yar are not typically disrespected by other races like the Unggoy. Thus, they had no true desire to gain a higher rank in the Covenant. Although, some Kig-Yar unsuccessfully protested their lowly position. In some cases, Sangheili or Jiralhanae disposed of criminals or prisoners by feeding them to Kig-Yar convicts, who eat the victim alive. If any of their kin are killed, Kig-Yar may put out a bounty known as a mev-ut and go after the culprits. Due to their vicious nature, they particularly go after the heads and cervical vertebrae of their targets. A Kig-Yar Sniper standing alongside a Special Operations Sangheili. "Yet some are effective snipers, and, once drawn into the Covenant they have proven loyal, though they are quarrelsome with the Unggoy and others at times." The Kig-Yar are unique among Covenant races: rather than being faithful followers of the San'Shyuum's religion, they served the Covenant due to the monetary rewards the Prophets paid them. Most were loyal only to their families and matriarchs, with service to the Great Journey only a distant consideration. However, due to their long service in the Covenant, a large number of them came to accept the Covenant religion. Although the Kig-Yar held a rather low standing in the Covenant hierarchy, their position closely resembled a separate and independent entity that operated as mercenaries for the Covenant; most Kig-Yar saw their service in the Covenant as a business arrangement, rather than a true religious and spiritual journey. The Kig-Yar were not represented on the High Council but were instead vetted by the Ministry of Concert. The Kig-Yar did not vocally complain about their position but had instead selected to siphon off resources to their brethren, to which the Covenant powers either turned a blind eye to or were unaware of it. Black markets were also operated on High Charity by the Kig-Yar; the Hierarchs were aware of it, but seemingly only monitored the markets. Unlike some species in the Covenant, the culture of the Kig-Yar did not suffer as a result of their incorporation to the hegemony. When the Covenant was dissolved at the end of the Human-Covenant War, Kig-Yar society and culture experienced little change. Kig-Yar served primarily as light infantry, police forces, overseers, and marksmen. They were commonly used for interdiction, infiltration, and assassination operations. Kig-Yar privateers also commonly crew Covenant missionary ships, such as the Minor Transgression. Originally, they were intended to replace the Unggoy as the foot soldiers of the Covenant, but their temperament made this impractical. Instead, they were assigned roles that were better suited to their natural abilities, such as scouts and snipers. Due to their unique position in the Covenant, the Kig-Yar often utilized starships of their own making instead of Covenant-made ones. In addition, they were forbidden to build their own slipspace drives, and had to rely on heavily regulated, unmodifiable drives engineered by the San'Shyuum instead. The Kig-Yar government on Eayn is a post-industrial capitalist system, with a population of 978 million. It is also described as an ochlocracy, a system of government best described as a government by mob, or the intimidation of constitutional authorities; whatever form of local government the Kig-Yar possess is ineffective and ignored. Before the Kig-Yar's inauguration to the Covenant, all colonies were self-governed. Due to the lack of Eayn's government, Kig-Yar colonists developed their economy based on the gray market. Eayn's government also had a functioning militia. Clans often governed certain portions of cities on Kig-Yar worlds. After the Kig-Yar joined the Covenant, all of their governmental systems became obsolete. Following the Covenant's dissolution after the Human-Covenant War, the Kig-Yar had no true functioning government to control Eayn and its colonies. Instead, all Kig-Yar worked together, relatively cooperatively. In April 2553, Chol Von attempted to form a united Kig-Yar navy and have all Kig-Yar clans unite, but few agreed that it was necessary. By 2558, pseudo-governments have administrative control of Eayn's two supercontinents, Ruuht and Ah'lomet. There is controversy among both continents about which one has control of the small islands between the two. To humans and other species, the Kig-Yar language is seemingly composed of hisses, growls, screeches, snarls, and squawks, though it is still intelligible to other members of the Covenant. The Kig-Yar are able to speak the Sangheili language, which serves as the lingua franca to the Covenant. In addition, Kig-Yar are also capable of speaking the human English language in a rasped manner. However, most Kig-Yar are unable to form a proper "f" sound in speech. After the war, some Kig-Yar often spoke amongst each other speaking an odd mix of English, Sangheili, and the Kig-Yar dialect. Kig-Yar names usually consist of a single syllable, with two consonants and one vowel, such as Yeg, Jak, and Bok. However, Chur'R-Yar and Chur'R-Mut, who were both shipmistresses, have multiple syllables in their names. While some Kig-Yar possess clan names (e.g. Chol Von, Eith Mor), most were not allowed by the Sangheili to have more than one name during their service in the Covenant—though most were not particularly bothered by the edict as their society never placed a premium to it; this limitation was abolished after the Covenant's dissolution. Some names are often more common among certain clans. The prefix "Chur'R-" is believed to indicate the title of Shipmistress, as both Chur'R-Yar and Chur'R-Mut were female Kig-Yar in command of a vessel. Chol Von's name lacks this prefix, although it is possible that this is due to cultural differences between the common Kig-Yar and the T'vaoans, or that the use of the prefix indicated the Shipmistresses' service to the Covenant like the "-ee" suffix used by the Sangheili. Alternatively, Chur'R-Yar and Chur'R-Mut may simply have been related, with the prefix being a family name rather than carrying any significance in regard to their role. Eayn is the homeworld of the Kig-Yar species and is the primary satellite of the planet Chu'ot. It is characterized by its single equatorial ocean, sparse volcanism, and almost total lack of glaciation. Only about one-third of all Kig-Yar who still reside in the Y'Deio system call Eayn their home; many have chosen to live among the minor planets within the asteroid belt since their initial contact with the Covenant. The most notable Kig-Yar interplanetary colonies are known as Muloqt, Kaelarot, and Valyanop; other Kig-Yar colonies include Dal'koth, as well as T'vao, home of the Skirmishers. In the original Covenant, Kig-Yar were divided into several different ranks. Males formed the bulk of most of Kig-Yar presence in the Covenant military, while females were often given command positions. Within the Covenant and its remnants, the rank of Minor is the lowest field rank a Kig-Yar can attain. They are armed with standard-strength, light-blue point defense gauntlets and small arms such as the plasma pistol or Needler. After gaining a sufficient amount of experience, Kig-Yar can be promoted to the rank of Major. Majors are more experienced than Minors and are issued stronger point-defense gauntlets that emit a violet, red or orange-colored shield and carry heavier weaponry. In the Covenant, Kig-Yar hold a relatively low position and have little authority. 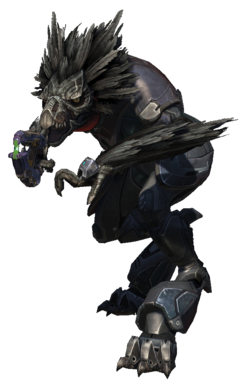 Minors are typically commanded by Sangheili or Jiralhanae leaders, while Majors may lead their own file or even lance consisting of low-ranking Unggoy and Yanme'e but are still subject to the command of the higher-ranking species. Several specialist ranks exist of the Kig-Yar. The Kig-Yar rank of Sniper comprises the Covenant's foremost long-range combatants. They are known to carry weapons such as needle rifles and particle beam rifles, but do not use point defense gauntlets as to better wield their weapon. Kig-Yar Rangers are part of the Covenant's Special Warfare Group division, Fleet Security, and are trained for zero-G EVA combat, and are equipped with vacuum suits and magnetic boots. One of the highest ranks obtainable by a Kig-Yar in the Covenant was Zealot. T'vaoans featured their own ranking system within the Covenant, with different roles and operational objectives. The rank structure in Jul 'Mdama's Covenant retains much of the structure of the Covenant hegemony: Kig-Yar are lower-ranking than Sangheili and Mgalekgolo, but have more authority than the Unggoy. The lowest rank in the faction for a Kig-Yar is the Storm unit. This unit is virtually the same as the Minor rank in the Covenant, albeit inferior weapons and armor. With experience, Storm Kig-Yar can be promoted to the rank of Heavy. They are typically deployed as scouts and trackers, as well as for boarding actions. Former ranks from the old Covenant, such as Sniper and Ranger, still continue to exist. Some Kig-Yar have gained the rank of shipmistress, and are able to lead their own ships. Because of the matriarchal nature of Kig-Yar society, most Kig-Yar ship commanders are female, hence their use of the feminine form of the Covenant title of shipmaster. While there are male Kig-Yar shipmasters, they are less common. They are often employed by the Covenant's Ministry of Tranquility. These Kig-Yar are mostly given command of ships made by the Kig-Yar themselves, such as privateers and raiders, rather than larger and more powerful vessels of mainline Covenant design. However, some still commanded Covenant frigates. Kig-Yar were also employed by the Covenant as prison guards to protect penal colonies, such as the one on Verge. 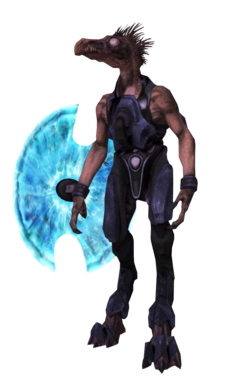 The Kig-Yar were often used as a police force in former Covenant colonies, although normally under the supervision of a representative from one of the races higher in the Covenant hierarchy. The Kig-Yar were believed to have been given the responsibility due to their intimidating and threatening appearance they often project, keeping the Unggoy in-line. French Les Jackals in Halo: Combat Evolved. Les Rapaces in all media since Halo 2. A "jackal" is a wild scavenging dog (similar to the coyote) that lives primarily in northern Africa. The name is used in reference to the Kig-Yars' scavenging nature. "Kig-Yar" is an Anglicized form of the Welsh term for chicken meat, "cig iâr". Although Jackals carry grenades in Halo 2 , they are never seen using them. This is likely because they dual-wield their energy shield with whatever weapon they are carrying in the game's engine. In all games prior to Halo: Reach, all Jackals shoot left-handed and are the only Covenant species to do so. 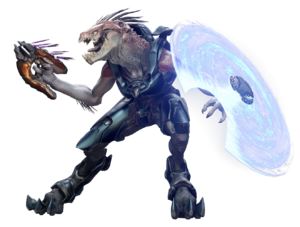 However, in Halo: Reach and Halo 4 Jackals shoot with their right hands and carry their shields with their left hands; this generally makes it harder to shoot through the gap in a Jackal's energy shield as all player characters are right-handed. "Wild Jackals" appear in early concept art for Halo Wars. Their dress resembles that of the eponymous aliens from the Predator franchise. The Jackal language was created by reverse-playing speech recordings of Martin O'Donnell, the composer of Bungie's Halo games. The Ibie'shan Jackals introduced in Halo 4 closely resemble Zilla, the eponymous monster of the 1998 American Godzilla film. In Halo 5: Guardians, the Kig-Yar speak English allowing the player to understand them for the first time in-game. A very early concept for the Jackal in Halo: Combat Evolved. A Kig-Yar on Installation 04 in Halo: Combat Evolved. Two Jackals in Halo: Combat Evolved. The Jackal model for Halo: Combat Evolved that was intended to appear in Halo 2. A Kig-Yar sniper from Halo 2 with a Type-50 particle beam rifle. A Kig-Yar Minor with an overcharged plasma pistol in Halo 2. A Kig-Yar Minor on patrol on The Ark in Halo 3. A Kig-Yar sniper in Halo 3. Prototype of McFarlane Toys' Jackal figure. Concept art of the Kig-Yar for Halo Wars. Concept art of a "Wild Jackal" for Halo Wars. A Kig-Yar sniper and a Kig-Yar infantryman seen in Halo 3: ODST. A Kig-Yar lance armed with plasma pistols and point defense gauntlets in Halo 3: ODST. Concept art from Halo Legends: Homecoming. Profile image of a Kig-Yar in Halo: Reach. A Kig-Yar Major in Halo: Reach. Concepts of an Ibie'shan Kig-Yar for Halo 4. Concept art of a Kig-Yar head in Halo 4. A Kig-Yar Storm and a few Unggoy Imperials on Requiem in 2558. Ibie'shan and Ruuhtian Kig-Yar on Minab in 2551 in Halo: Escalation. Gabriel Thorne killing an Ibie'shan and Ruuhtian Kig-Yar during Operation: ATHENA. A model for a Kig-Yar for Halo 2: Anniversary. Kig-Yar in Halo 2: Anniversary. A Kig-Yar in Halo: The Fall of Reach - The Animated Series. A Kig-Yar Heavy and Kig-Yar Storm aboard Argent Moon in Halo 5: Guardians. A comparison of in-game Jackals across the Halo series. ↑ In Halo: Combat Evolved, Jackals have squat heads, very bulbous eyes, baleen-like teeth, and dark green or reddish orange skin. This design has not been featured in any subsequent media and has seemingly been retconned from existence by Halo: Combat Evolved Anniversary. Anniversary instead uses the Halo: Reach design, though it is scaled down to the original Jackals' smaller frame, giving the Jackals squat heads and much shorter necks.